Cheers to a kid-free Momma’s night out at D’Vine in Downtown Fullerton. Nestled in the SOCO (south of Commonwealth) district in Downtown Fullerton, my girl friend, Katie, and I were invited to go on a Mediterranean culinary adventure. When we arrived we were immediately seated at our table of choice. I noticed the industrial feel of the decor, the wrought iron doors and brick walls made for interesting conversation while we waited to meet Chef Walid Alarja. There was a huge iron door that led to a reception area, where different events are hosted. The evening we dined at D’Vine they were hosting a painting night that looked like so much fun! We started off with a bowl of lightly fried pita chips which you dip in olive oil and Za’atar. Za’atar is a Middle Eastern spice blend which is made with toasted sesame seeds, sumac, salt and dried thyme. You dip the pita chip in the olive oil then the Za’atar coats the chip, which was ¡muy delicioso! What a treat it was that Chef Walid catered to us table side as we got to indulge in this incredible cuisine. He started us off with a yummy cocktail. I chose the Mediterranean Cooler while my friend, Katie, opted for the classic Mediterranean mojito. Both cocktails were nothing short of perfection. My cocktail had the perfect blend of sweetness, just how I like it and well, you can’t go wrong with a mojito! Katie mentioned that her cocktail was a classic, refreshing mojito with just the right part of tartness. Chef Walid made us feel right at home. We often eat with our eyes, so we were excited for all the bright vibrant colors of the delicious Mediterranean spread Chef Walid had prepared for us. He brought out a sampler platter of some traditional Mediterranean dishes for us to try. The platter consisted of their creamy hummus, beet salad, white cabbage salad, Mutabel-Baba Ghanoush (grilled eggplant with tahini, yogurt and lemon juice) and Mediterranean salad served with a side of warm pita bread. Everything was amazing! We loved how many of the dishes were simple but full of flavor! It is apparent that Chef Walid was born to cook and is very proud of his food and culture. Clearly, you can taste it in his dishes. Walid’s commitment to fresh and healthy ingredients is delightful. Everything tasted so fresh and you knew you were eating something home-made, made from scratch, healthy and delicious. If you love cheese, then the cheese fatayer on the Hot Mezza’s section of the menu is one you should definitely order. The lightly fried dough with Mediterranean cheeses sure satisfied our cheese craving. Another traditional item we tried was the falafel. If you’re not familiar with a falafel, it is made out of crushed chick peas, parsley, onion and house spices. It is also accompanied with two side dipping sauces, tahini and hot sauce. I am not a fan of spice, so I shied away from the hot sauce, but Katie loved dipping the falafel in both the tahini and hot sauce for more of a kick. When Chef Walid asked us what we would like for our entrees we couldn’t decide so we asked him to surprise us! Lamb is a traditional dish, but we did mention to him that we weren’t fond of lamb. Instead he made us grilled shrimp, chicken and beef kebab plate on a bed of rice accompanied with their hot sauce and garlic sauce. Everything was so juicy and made perfectly. Oh my goodness, the aroma of the garlic sauce was so tantalizing and the taste was mouth-watering. Katie said she wanted to “drink it [garlic sauce] all”. You can take home a jar of garlic sauce also known as yummy goodness for $5 along with Za’atar. After our delicious meal, I enjoyed a hot cup of Mediterranean tea garnished with a mint leaf. Most of the time, I stay away from hot tea after a meal because I like it sweet and I usually have to pour tons of sweeteners just to get it how I like it. To my surprise, the Mediterranean tea was already naturally sweet and it didn’t require any sugar or sweetener. I could drink endless amounts of this stuff! D’Vine is a place where friends and family come to share a dining experience that offers the best in flavor and tradition. 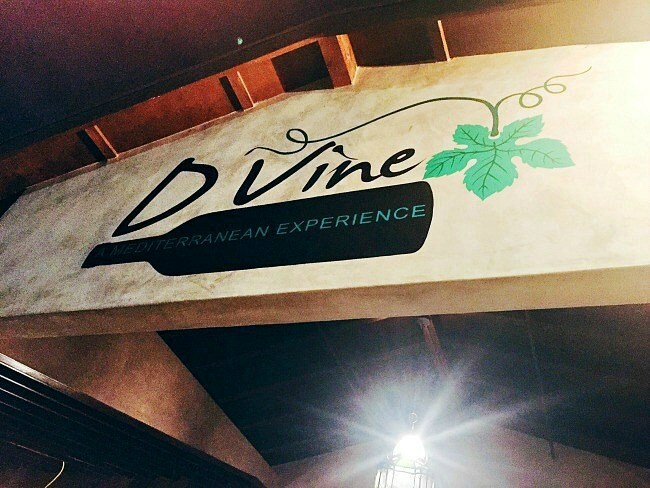 If you’re looking to try something new and treat all of your senses to authentic Mediterranean cuisine, D’Vine is the place to be!